Over half the time customers spend in-store is associated with negative emotions that occur during steps that involve trade-in appraisal, negotiating deal terms, vehicle financing and evaluating insurance and add-on products. Dealerships need to align with growing consumer demand for a car-buying process that is convenient and fast by implementing a streamlined sales process that integrates online and offline activities. Digital retailing tools can help dealers achieve this integration. In addition to improving the customer experience, digital retailing can increase fixed ops profitability and allow dealerships to sell vehicles an average of six days faster. 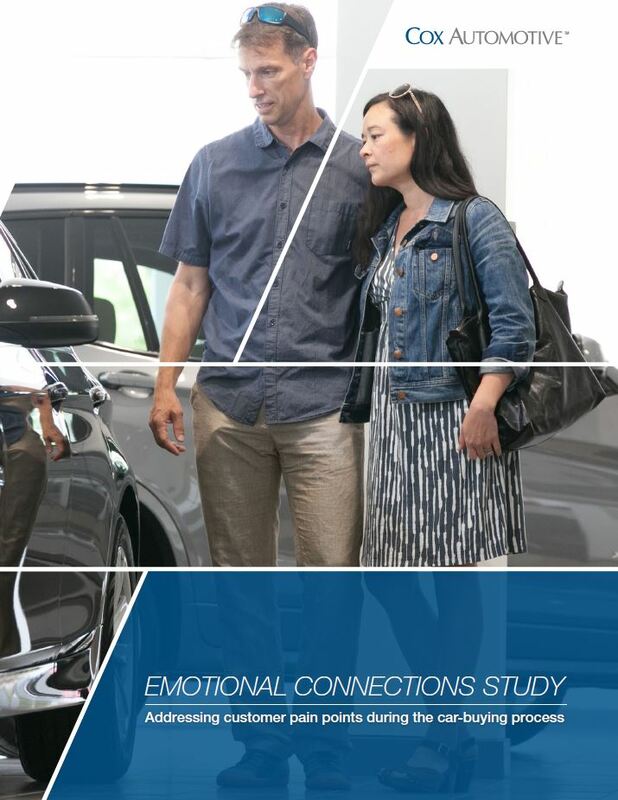 It’s no surprise that buying or leasing a vehicle is an emotional experience for consumers, but the Cox Automotive 2018 Emotional Connections Study reveals the specific emotions and pain points consumers undergo through all phases of the vehicle purchase process. Armed with insight into these varying emotions, dealers have an opportunity to reduce negative emotions and enhance positive portions of the experience. Download this examination of two hypothetical car-buying scenarios that highlight typical consumer emotions during the buying process and best practices dealers can use to improve customer satisfaction. Download the full study that features two hypothetical car-buying scenarios highlighting typical consumer emotions during the car-buying process and best practices dealers can use to improve customer satisfaction.